Edward I, King of England, born at Westminster on the 17th of June 1239, was the eldest son of King Henry III and Eleanor of Provence. He was baptized Edward after Edward the Confessor, for whom Henry had special veneration, and among his godfathers was Simon de Montfort, Earl of Leicester, his aunt Eleanor's husband. 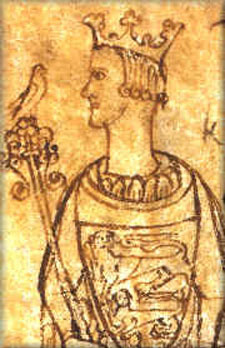 His political career begins when the conclusion of a treaty with Alphonso X of Castile, by which he was to marry the Spanish king's half sister Eleanor, necessitated the conferring on him of an adequate establishment. His father granted him the Duchy of Gascony, the Earldom of Chester, the king's lands in Wales and much else. The provision made was so liberal that Henry's subjects declared he was left no better than a mutilated king. In May 1254 Edward went to Gascony to take possession of his inheritance. He then crossed the Pyrenees, and in October was dubbed knight by Alphonso and married to Eleanor at the Cistercian convent of Las Huelgas, near Burgos. He remained in Gascony until November 1255, but his father was too jealous to allow him a free hand in its administration. After his return, the attempts of his agents to establish English laws in his Welsh possessions brought Edward into hostile relations with the Welsh. Here also his father would give him no help, and his first campaign brought him little result. Edward became extremely unpopular through his association with his Lusignan kinsfolk, his pride and violence, and the disorders of his household. In 1258 his strenuous opposition to the Provisions of Oxford further weakened his position, but, after the banishment of the foreigners, he began to take up a wiser line. In 1259 he led the young nobles who insisted that the triumphant oligarchy should carry out the reforms to which it was pledged. For a moment it looked as if Edward and Leicester might make common cause, but Edward remained an enemy of Montfort, though he strove to infuse his father's party with a more liberal and national spirit. He was the soul of the reconstituted royalist party formed about 1263. In 1264 he took a prominent part in the fighting betweenthe king and the barons. At the battle of Lewes his rash pursuit of the Londoners contributed to his father's defeat. Two days later Edward surrendered to Leicester as a hostage for the good behavior of his allies. He was forced to give up his earldom of Chester to Leicester, but at Whitsuntide 1265 he escaped from his custodians, and joined the lords of the Welsh march who were still in arms. With their aid he defeated and slew Leicester at Evesham on the 4th of August 1265. For the rest of Henry III's reign Edward controlled his father's policy and appropriated enough of Leicester's ideals to make the royalist restoration no mere reaction. So peaceful became the outlook of affairs that in 1268 Edward took the cross, hoping to join the new crusade of St. Louis. Want of money delayed his departure until 1270, by which time St. Louis was dead, and a truce concluded with the infidel. Refusing to be a party to such treason to Christendom, Edward went with his personal followers to Acre, where he abode from May 1271 to August 1272. Despite his energy and valor he could do little to prop up the decaying crusading kingdom and he narrowly escaped assassination. At last the declining health of his father induced him to return to the West. He learned in Sicily the death of Henry III on the 16th of November 1272. On the 20th of November, the day of Henry's funeral, he was recognized as king by the English barons, and from that day his regnal years were subsequently computed. Affairs in England were so peaceful that Edward did not hurry home. After a slow journey through Italy and France he did homage to his cousin Philip III at Paris, on the 26th of July 1273. He then went to Gascony, where he stayed nearly a year. At last he landed at Dover on the end of August 1274, and was crowned at Westminster on the 18th of the same month. Edward was thirty-five years old when he became king, and the rude schooling of his youth had developed his character and suggested the main lines of the policy which he was to carry out as monarch. He was a tall, well-proportioned and handsome, man, extravagantly devoted to military exercises, tournaments and the rougher and more dangerous forms of hunting. He had learned to restrain the hot temper of his youth, and was proud of his love of justice and strict regard to his plighted word. His domestic life was unstained, he was devoted to his friends, and loyal to his subordinates. Without any great originality either as soldier or statesman, he was competent enough to appropriate the best ideas of the time and make them his own. His defects were a hardness of disposition which sometimes approached cruelty and a narrow and pedantic temper, which caused him to regard the letter rather than the spirit of his promises. His effectiveness and love of strong government stand in strong contrast to his father's weakness. Though he loved power, and never willingly surrendered it, he saw that to be successful he must make his policy popular. Thus he continued the system which Montfort had formed with the object of restraining the monarchy, because he saw in a close alliance with his people the best means of consolidating the power of the crown. The first years of Edward's reign were mainly occupied by his efforts to establish a really effective administration. In carrying out this task he derived great help from his chancellor, Robert Burnell, bishop of Bath and Wells. Administrative reform soon involved legislation, and from 1275 to 1290 nearly every year was marked by an important law. Few of these contained anything that was very new or original. They rather illustrate that policy which caused William Stubbs to describe his reign as a "period of definition." Yet the results of his conservative legislation were almost revolutionary. In particular he left the impress of his policy on the land laws of England, notably by the clause De Donis of the Westminster statute of 1285, and the statute Quia Emptores of 1290. The general effect of his work was to eliminate feudalism from political life. At first he aimed at abolishing all franchises whose holders could not produce written warranty for them. This was the policy of the statute of Gloucester of 1278, but the baronial opposition was so resolute that Edward was forced to permit many immunities to remain. Though the most orthodox of churchmen, his dislike of authority not emanating from himself threatened to involve him in constant conflict with the Church, and notably with John Peckham, the Franciscan friar, who was Archbishop of Canterbury from 1279 to 1292. The statute of Mortmain of 1279, which forbade the further grant of lands to ecclesiastical corporations without the royal consent, and the writ Circumspecte Agatis of 1285, which limited the church courts to strictly ecclesiastical business, both provoked strong clerical opposition. However, Peckham gave way to some extent, and Edward prudently acquiesced in many clerical assumptions which he disliked. He was strong enough to refuse to pay the tribute to Rome which John had promised, and his reign saw the end of that papal overlordship over England which had greatly complicated the situation under his father. Besides administration and legislation, the other great event of the first fifteen years of Edward's reign was the conquest of the principality of Wales. It was part of Edward's policy of reconciliation after the battle of Evesham that in the treaty of Shrewsbury of 1267 he had fully recognized the great position which Llewelyn ab Gruffyd, prince of Wales, had gained as the ally of Simon de Montfort. However, Llewelyn's early successes had blinded the Welsh prince to the limitations of his power, and he profited by Edward's early absences from England to delay in performing his feudal obligations to the new king. Even after Edward's return Llewelyn continued to evade doing homage. At last Edward lost patience, and in 1277 invaded north Wales. He conducted his campaign like a great siege, blocking all the avenues to Snowdon, and forcing Llewelyn to surrender from lack of supplies. He thereupon reduced the Welsh prince to the position of a petty north Welsh chieftain strictly dependent on the English. For the next five years Edward did his best to set up the English system of government in the ceded districts. The Welsh resentment of this soon gave Llewelyn another chance, and compelled Edward to devote the years 1282-83 to completing his conquest. In 1284 he issued the statute of Wales, which provided for a scheme for the future government of the principality. Edward is often called the conqueror of Wales, but in truth he only effected the conquest of Llewelyn's dominions. The march of Wales was only indirectly affected by his legislation, and remained subject to its feudal marcher lords until the 16th century. Edward was very careful in his foreign policy. Though preserving nominal peace with his cousin Philip III of France, his relations with that country were constantly strained. After Philip III's death in 1285, Edward crossed the Channel in 1286, to perform homage to his successor, Philip the Fair. He remained abroad until 1289, busied in attempts to improve the administration of Gascony, and making repeated and finally successful efforts to end by his mediation the still continuing struggle between the houses of Anjou and Aragon. His long absence threw the government of England into confusion, and on his return in 1289 he was compelled to dismiss most of his judges and ministers for corruption. In 1290 he expelled all Jews from England. The affairs of Scotland furnished Edward with his chief preoccupation for the rest of his reign. After the death of Alexander III, in 1286, Scotland was governed in the name of his granddaughter Margaret, the Maid of Norway. The English king had suggested that Edward of Carnarvon, his eldest surviving son, should marry the little queen of Scots, and thus bring about the union of the two countries. Unluckily the death of Margaret in 1290 frustrated the scheme. The Scottish throne was now disputed by many claimants, and the Scots asked Edward to arbitrate between them. Edward accepted the position, but insisted that, before he acted, the Scots should recognize him as their overlord. The claimants set the example of submission, and soon the chief Scots nobles followed. Thereupon Edward undertook the arbitration, and in 1292 adjudged the throne to John Baliol. The new king did homage to Edward, but his subjects soon began to resent the claims of jurisdiction over Scotland, which Edward declared were the natural results of his feudal supremacy. At last the Scots deprived John of nearly all his power, repudiated Edward's claims, and made an alliance with the French. During the years of the Scottish arbitration Edward had slowly been drifting into war with France. The chronic difficulties caused by French attempts to confine Edward's power in Gascony were now accentuated by the quarrels between the sailors and merchants of the two countries. In 1293 Edward was persuaded by his brother, Edmund, Earl of Lancaster, to yield up Gascony temporarily to Philip the Fair. But Philip refused to restore the duchy, and Edward, seeing that he had been tricked, declared war against France, at the very moment when the Scottish resistance gave the French a firm ally in Britain. To make matters worse, the Welsh rose in rebellion. It was therefore quite impossible for Edward to recover Gascony. The most critical years of Edward's reign now began. He saw that he could only meet his difficulties by throwing himself on the support of his own subjects, and convoked, in 1295, a representative parliament of the three estates, which has been called in later times the Model Parliament, because it first illustrated the type which was to be perpetuated in all subsequent parliaments. "What touches all", ran Edward's writ of summons, "should be approved of all, and it is also clear that common dangers should be met by measures agreed upon in common." The parliamentary constitution of England was established as the result of Edward's action. Secure of his subjects' allegiance, Edward put down the Welsh revolt, and conquered Scotland in 1296. When quiet was restored to Britain, he hoped to throw all his energy into the recovery of Gascony, but new troubles arose at home which once more diverted him from his supreme purpose. Led by Archbishop Winchelsea, Peckham's successor, the clergy refused to pay taxes in obedience to the bull of Pope Boniface VIII, called Clericis Laicos. Edward declared that if the clergy would not contribute to support the state, the state could afford them no protection. But the clerical opposition was soon joined by a baronial opposition. Headed by the earls of Hereford and Norfolk, many of the barons declined to join in an expedition to Gascony, and Edward was forced to sail to the French war, leaving them behind. Thereupon the recalcitrant barons forced upon the regency a fresh confirmation of the charters, to which new articles were added, safeguarding the people from arbitrary taxation. Edward at Ghent reluctantly accepted this Confirmatio Cartarum, but even his submission did not end the crisis. In the same year (1297), all Scotland rose in revolt under the popular hero William Wallace, and next year (1298), Edward was forced to undertake its reconquest. The battle of Falkirk, won on the 22nd of July, was the greatest of Edward's military triumphs; but, though it destroyed the power of Wallace, it did not put an end to Scottish resistance. Bitter experience taught Edward that he could not fight the French and the Scots at the same time, and in 1299 he made peace with Philip, and, Eleanor having died in November 1290, he married the French king's sister Margaret (c. 1282-1318), and some years later obtained the restitution of Gascony. In the same spirit he strove to destroy the clerical and baronial opposition. He did not succeed in the former task until a complacent pope arose in his own subject, Pope Clement V, who abandoned Winchelsea to his anger, and suffered the archbishop to be driven into exile. The baronial leaders could not be wholly overthrown by force, and Edward was compelled to make them fresh concessions. It was not until 1303 that Edward was able to undertake seriously the conquest of Scotland. By 1305 the land was subdued, and Wallace beheaded as a traitor. But Edward had hardly organized the government of his new conquest when a fresh revolt broke out under Robert the Bruce, grandson of the chief rival of Baliol in 1290. Bruce was soon crowned king of Scots, and at the age of seventy Edward had to face the prospect of conquering Scotland for the third time. He resolved to take the field in person; but the effort was too great, and on the 7th of July 1307 he died at Burgh-on-Sands, near Carlisle. His death destroyed the last faint hope of conquering Scotland, and showed that the chief ambition of his life was a failure. Yet his conquest of Wales, his legislation, his triumph over his barons, his ecclesiastics, and the greatest of French medieval kings indicate the strength and permanence of his work. He was buried at Westminster under a plain slab on which was inscribed Edwardus Primus Scottorum malleus hic est. Pactum serva. By Eleanor of Castile Edward had four sons, his successor King Edward II and three who died young, and nine daughters, including Joan, or Joanna (1272-1307), the wife of Gilbert de Clare, Earl of Gloucester (d. 1295), and then of Ralph de Monthermer; Margaret (1275-1318), the wife of John II, Duke of Brabant; and Eleanor (1282-1316), who married John I, Count of Holland, and then Humphrey Bohun, Earl of Hereford (d. 1322). By Margaret of France the king had two sons: Thomas of Brotherton, Earl of Norfolk, and Edmund of Woodstock, Earl of Kent.